FILE - Brazil's President Dilma Rousseff attends an event launching the "Olympic Year for Tourism" in Brasilia, Brazil, Oct. 7, 2015. Brazilian opposition efforts to unseat President Dilma Rousseff advanced Wednesday when the speaker of lower house of Congress opened impeachment proceedings against her, a move that threatens to mire the government in political wrangling as the economy nosedives. Opposition parties filed the request in September, accusing the unpopular president of violating Brazil's fiscal laws and manipulating government finances to benefit her re-election campaign last year. Eduardo Cunha, speaker of the lower house, said he had agreed to open proceedings. A special committee with members from all parties will decide on the merits of the request, which then needs two-thirds, or 342, of the votes of the chamber to suspend the president pending a 90-day trial by the Senate. FILE - Eduardo Cunha, president of of Brazil’s Chamber of Deputies. Cunha, from the centrist Brazilian Democratic Movement Party, a fractious partner in the governing coalition, is himself fighting for political survival in the face of calls for his ouster and multiple investigations for allegedly taking bribes. But his power to start impeachment proceedings has given him a trump card against Rousseff and the governing coalition, which is splintering under the weight of Brazil's worst recession in 25 years and a massive graft scandal. 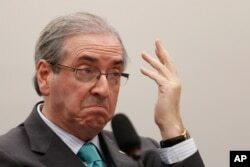 "The basis of this [impeachment proceeding] is purely technical," said Cunha, dismissing the idea that his decision was motivated by personal or political reasons. Dozens of politicians, including Cunha, have been implicated in a price-fixing and political kickback scheme uncovered at state-run oil company Petrobras. He has denied the allegations.